We asked travel experts about the hottest places to visit in 2019. Summer might be almost over, but that doesn’t mean you can’t start planning your next getaway. Instead of hitting the same old tourist hotspots that you’re seeing all over Instagram, why don’t you try something a bit more off the beaten path next year? Not only will you avoid long lines at the must-see restaurants and sights, but you might just discover a new culture or type of cuisine you never knew you loved. There are so many amazing reasons to travel as much as you can—from great design to just learning how to unplug—and according to the top travel experts, there’s so much out there that you’re just not exploring. So, we talked to the best of them to find out where you should travel to in 2019. Book now, before everybody follows. While you shouldn’t totally discount Dublin (it has a budding design scene), consider its neighbor to the north instead. Belfast is the capital of Northern Ireland, which is part of the United Kingdom, so expect everything to be different than what you’ll find on the rest of the island of Ireland—from the currency to the accent. Melissa Da Silva, president of sister companies Trafalgar and Brendan Vacations, suggests you start off with the historic Titanic Museum, where you can explore the docks of the famed ship, and then scope out the scenic Antrim Coast. The beaches are extraordinary, and you can even look out to the remote Isle of Man, halfway between Ireland and Scotland. If you dare to venture out further, you have to stop at the famed Giant’s Causeway, which, according to folklore, is believed to have been built by an actual giant. And don’t think there aren’t great hotels to stay at, either: According to Da Silva, the city is ready for an influx of visitors, with 3,700 new hotel rooms built just last year. Take a peek at either Ten Square, a boutique hotel occupying a mid 19th-century warehouse and decked out with mid-century modern design, or the La Mon Hotel & Country Club, an idyllic rural getaway. Dubai is dripping with cosmopolitan glitz and glam, thanks to its striking architecture, high number of expats, and a serious shopping scene, but for a touch of Middle Eastern cuisine and culture without the wild times, head to Abu Dhabi. The often over-looked UAE state had 10 million fewer visitors than Dubai did last year, according to founder and president of Friendly Planet Travel Peggy Goldman, but offers unparalleled landscapes that are hard to beat. 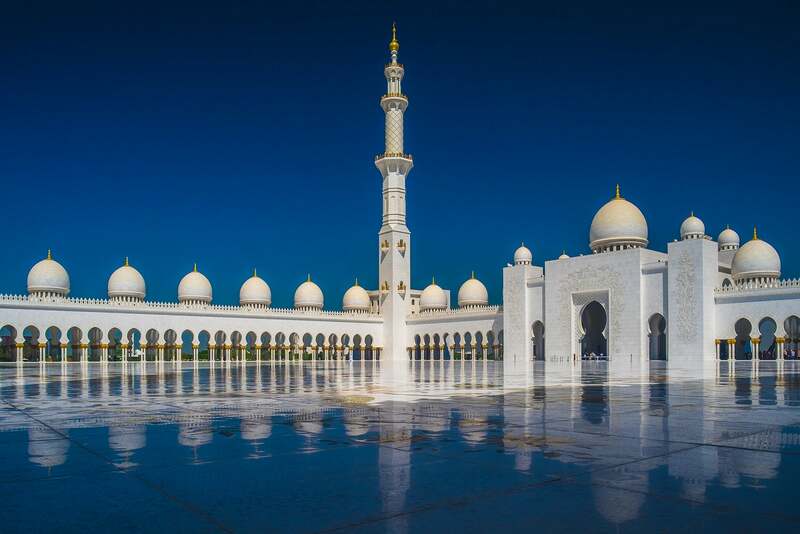 Other can’t-miss spots include the white marble and crystal embellished Sheikh Zayed Grand Mosque—one of the largest mosques in the world, and the largest in the country—and the newly installed Louvre Abu Dhabi, which is a must for culture lovers. While often viewed as a New York-centric fall escape that isn’t the Hudson Valley, the Finger Lakes region is actually well-known for its vast collection of wineries, including Domino favorites Heart & Hands and Hermann J. Wiemer Vineyard—which you need to stop at for the delicate Rieslings. According to travel journalist and frequent upstate New York visitor Caleigh Alleyne, music lovers should also head to the region in order to enjoy festivals such as the Grassroots Festival, all while experiencing new lakeside restaurants and distilleries such as Hook & Spoon and Waterman’s Distillery. See Domino’s entire guide to the Finger Lakes here, and be sure to stay at the Inns of Aurora, a collection of four luxurious lakeside inns with stunning decor and old-school charm. Although everyone should see Iceland’s stunning Blue Lagoon at least once in their lifetime, the Baltic state of Latvia has some gorgeous Scandi-inspired moments that make it a must-see as well, insists Da Silva. Consisting of miles of unspoiled countryside, pristine beaches, and unpretentious charm, Latvia has been largely undiscovered by hordes of tourists. The coastal capital of Riga is a wonderful mix of modern and classic, with the Old Town boasting cobbled streets, Gothic and Baroque-style churches, and hidden courtyards. The New Town has wide open spaces and Jugendstil Art Nouveau architecture. Also peek the Freedom Monument, a testament to Latvia’s battle for independence. Japan’s capital and busiest metropolis, Tokyo is rich with vibrant dining opportunities, culture, architecture, technology, and shopping. But if you’ve already done it or are looking for a quieter escape, the Setouchi region should definitely be on your list, says Mika White of the Japanese Tourism Institute. Known primarily for the historic city of Hiroshima, the Setouchi region offers some of the most beautiful scenery in the country, with calm waters allowing visitors a sense of tranquility and peace. “As Japan gears up for the 2020 Summer Olympics in Tokyo, the Setouchi region of Japan looks to shine a light on the untouched destination,” says White. Some highlights of the region include Naoshima Island, where larger-than-life art installations by Yayoi Kusama, as well as art museums designed by Japanese architect and Pritzker Prize winner Tadao Ando reside. If you go in October, don’t miss the Cycling on the Shimanami Kaido Event, where amateurs and experienced cyclists can participate in a cycling journey that takes them across some of Japan’s most beautiful suspension bridges, as well as through the Seto Inland Sea. If you’re an avid cycler, you definitely don’t want to miss this: The Shimanami Kaido has been named by CNN as one of the best cycling trails in the world. If you love gorgeous blue waters and island-hopping, but feel too old or partied out to go to Ibiza and Mallorca, editor-in-chief of Airbnb Mag, Mike Steele, recommends Sintra, Portugal. Only 40 minutes from Lisbon by train, the town is much bigger than the islands, and offers a host of other things to do besides beaches (although Steele highly recommends both Praia da Adraga and Praia da Ursa). Some other bucket list-worthy landmarks include architectural gem Pena Palace, the medieval-style Castle of the Moors, and Cabo de Roca, a scenic cape located at the most westerly point of mainland Europe. Not to mention, the food is outstanding, with hearty rice dishes stealing the show (so you definitely won’t miss the arroz). “If you fell in love with Athens, with its incredible ruins and sweeping sense of history, maybe think about going to Cusco, Peru,” says Steele. Similar to Athens, Cusco offers plenty of historically rich sights and activities. If you’re the adventurous type, be sure to hike the Pisac Ruins. Visit the Saqsaywaman Inca Complex for a double dose of ancient history, and scour San Pedro Market for a number of national delicacies, including tamales and salchipapas, a street food concocted with french fries, sausages, chilies, and a tomatoey sauce. An added bonus? Machu Picchu is just a 45-mile drive away. While the Greek Island of Mykonos is known for its blue Aegean backdrop and is one of the most popular places to visit in the region, Tom Barber, co-founder of Original Travel, a tailor-made itinerary company, insists that the wild Peloponnese peninsula is best the way to go to ditch the crowds, but still have a classic Greek experience. Some spots you definitely don’t want to miss? The Old Harbor, where blue architecture matches both ocean and sky, and Agia Paraskevi, a secluded beach with tranquil waters. Book a room at Poseidonion Grand Hotel, which boasts over 100 years of hospitality and brings a slice of the French Riviera to the region. While Cape Town has its share of incredible sights, including the iconic Victoria & Alfred Waterfront and riveting Nelson Mandela Museum, Da Silva notes that many travelers are now open to exploring other parts of Africa as well, including Kenya, Namibia, Botswana, and Tanzania. According to the United Nations World Tourism Organization, only 4.2 percent of the world’s tourists visited Africa last year, but they expect to double that number by 2030. These regions are less developed, so their natural beauty is the start; Da Silva suggests visitors take part in a mix of wildlife excursions (most notably the great migration of animals every January at Tanzania’s Ngorongoro Reserve), natural landmarks like Namibia’s Sossusvlei Dunes, and the great Victoria Falls. Man-made sights such as the Stone Town of Zanzibar and the Great Mosque in Dali are also musts. While people travel to Thailand for its beaches, culture, and perpetually sunny weather, the subcontinent of India has really gained traction over the past few years, according to Da Silva. The myriad of cultures means different cuisines, sights, and languages, depending on which state you go to, from the deserts of Rajasthan to the beaches of Goa. Da Silva suggests starting in the north to observe the Golden Temple in Amritsar, a holy shrine and place of worship that lights up every night, and the Taj Mahal in Agra, a UNESCO World Heritage Site and one of the seven wonders of the world. After that, explore Kolkata in the east, which boasts colonial architecture, the best seafood you’ve ever had, and several art galleries and culture festivals, and head south to Tamil Nadu and Kerala for palm-lined beaches, Dravidian-style temples, and stunning wildlife sanctuaries. And of course, you’ll want to stop at the country’s two busiest metropolises, Mumbai and Delhi, which host a combined population of over 40 million.